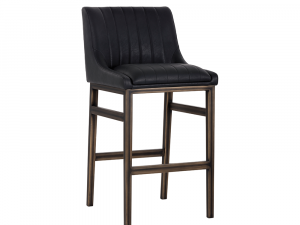 A sleek, urban designed Bar Stool featuring bold vertical stitching on the seat and back, for a distinguished retro look. 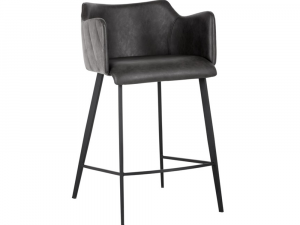 Features faux leather upholstery and a metal frame. Vintage black faux leather, with rustic bronze steel frame. Available in black, blue* or cognac faux leather. Frame available in standard rustic bronze. 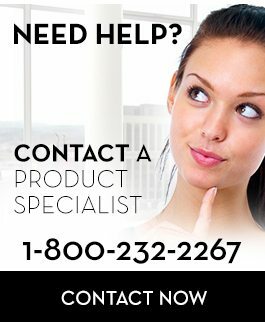 Order with polished stainless steel cantilever frame in-store for $100 up-charge. *Blue faux leather option only available with rustic bronze frame. 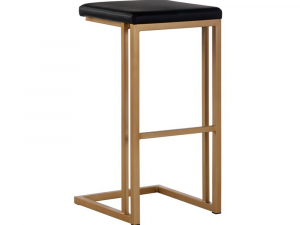 This modern stool was created with industrial design in mind; featuring a backless faux leather seat with a cantilever frame and a built in footrest. 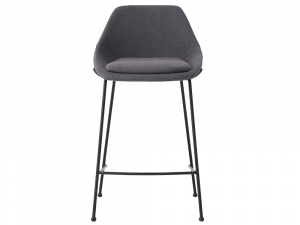 Available to order in Grey Steel or Champagne finish as a Bar Stool or Counter Stool. 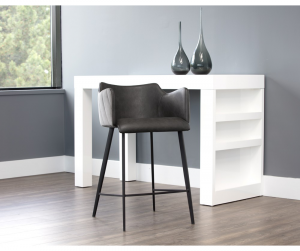 Providing comfort and style to any type of living space, this modern counter stool will be a great addition to your home. Grey Faux Leather seat and contrasting channel stitched exterior seatback in grey fabric. 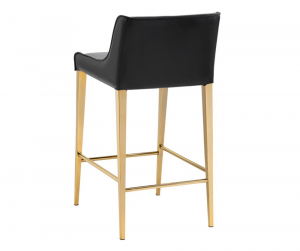 Available to order in-store as a Dining Arm Chair, Counter Arm Stool or Bar Arm Stool. 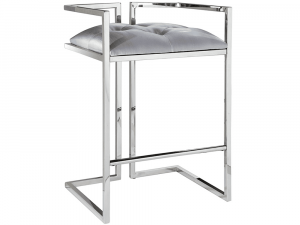 This modern stool will sit glamorously in your home. Upholstered in a black faux leather. 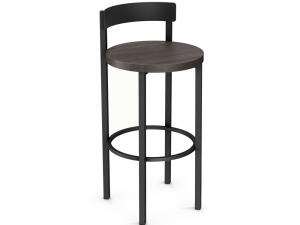 Available with an Obsidian black or Almond cover as a Dining Chair, Counter Stool or Bar Stool. 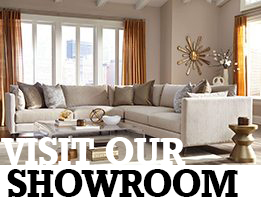 Showcasing organic textures and tonal hues, this lustrous collection of furniture provides eye catching designs that will effortlessly please your visual interests. 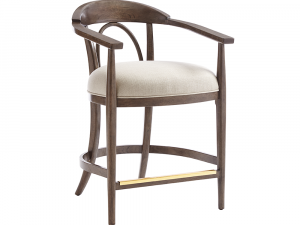 Seat and back are expertly upholstered in a Sawgrass linen-textured fabric. 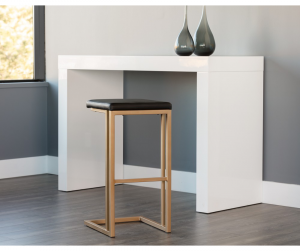 Available to order in Goldenrod or Alabaster finishes at no additional cost. 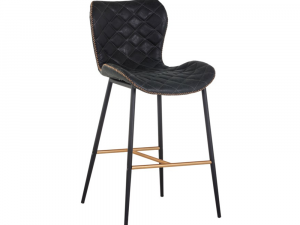 Featuring a sculpted diamond-stitched seat and contrast zig-zag stitching along the frame, this stylish stool is a bold addition to any style of living space. Upholstered in Antique Black Faux Leather. Stretchers in a contrast finish for added drama. Black steel, champagne gold accents. 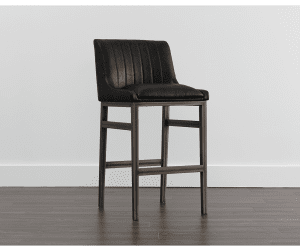 Available in Antique Brown or Antique Black Faux Leather, as a Dining Chair, Counter Stool or Bar Stool. This rustic woodsy Counter Stool is a classy addition to any breakfast nook or kitchen counter. 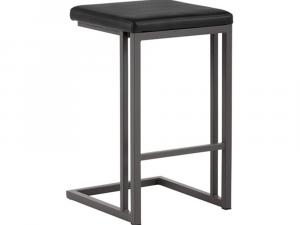 Featuring a solid wood seat and back in a shady finish, combined with a metal frame, in a black coral finish, this counter stool lends a distinctive urban industrial touch to your decor. 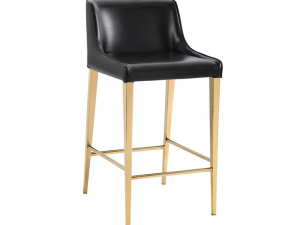 Available to custom order in-store in a variety of wood and metal finishes and as a 36″ bar stool. 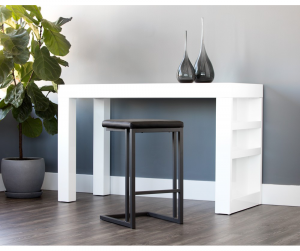 Perfectly elegant and chic, this counter stool will complement your modern contemporary home with style and comfort. Alternate cover in aspen white leatherette at no additional cost. Practical and comfortable. Curved to support the body while seated, the padded upholstered shell includes a removable seat cushion. With it’s eclectic design and comfortable structure, the Nixon chair looks at home in the dining room or office. 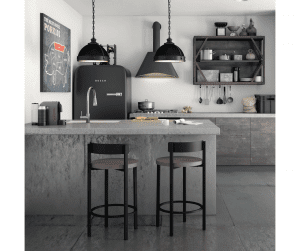 Upholstered in Dark Grey Fabric. 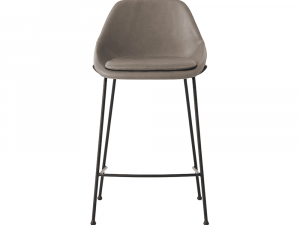 Available to order in Dark Grey or Light Beige Fabric, Brown or Grey Faux Leather. Also available as an Office Chair or Dining Chair. Upholstered in Grey PU Leather.